I wasn't gifted with hands made for fine, detail work. They're great for digging, demolition, and the fun stuff. When it comes time to sow small seeds (lettuce, carrots, etc) however, not so good. Inevitably I have to rely on the method of scattering seeds all over the place and then trying to thin them out into some semblance of order. I've been interested in seed tapes, since it saves a lot of seeds, a lot of time, and it looks better. But they also cost a lot more than I'm willing to pay. 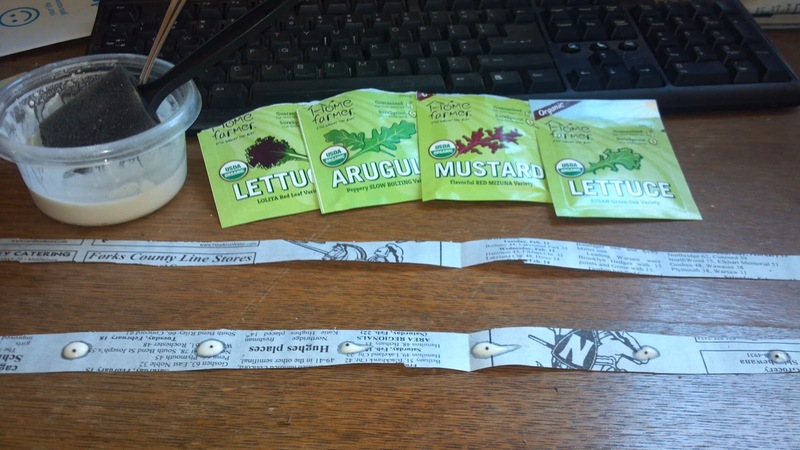 Pinterest has been full of ideas on how to make your own seed tapes; and sensing the opportunity to save some money, I dove right in. And surprisingly, they turned out really well! Time will tell how they work in practice. The "glue" is made by adding water to 1/4 cup of white flour and mixing well. How much water? Well, that depends. I added a tablespoon at a time. This started as a stiff doughy consistency, then doughy, then runny-doughy, then a little soupy, and finally to something that resembled thick latex paint. You want it just runny enough that it will drip off the end of your brush. For my "tape" I used extra newspapers, though just about anything will work (paper towels, drywall tape, etc). It just has to be biodegradable and contain no toxic chemicals. The standard 1/2" wide tape shown in the picture, with evenly spaced seeds dropped into globs of glue. These will be for creating your typical rows of lettuces. Then there was the 1 foot wide tape. These I got a little more creative with, making patterns with different colored greens to be used as a mescalin mix. This is where homemade tapes can really be fun. There is no limit to what you can create, or how large your "tape" can be. Just "glue" the tapes end to end, or in a triangle, or a circle, or whatever!